Reference 116520 replaced its predecessor reference 16520 in 2000. It most notably features caliber 4130, which is Rolex’s first in-house chronograph movement. Today, it is an iconic model, representing one of Rolex's many technical strides throughout horological history. The present watch is an incredibly rare and novel example of reference 116520, as the dial does not display the usually-found red 'Daytona' script at 6 o'clock. Most importantly, this watch is accompanied by correspondence between the owner and Rolex, confirming the originality of the dial. 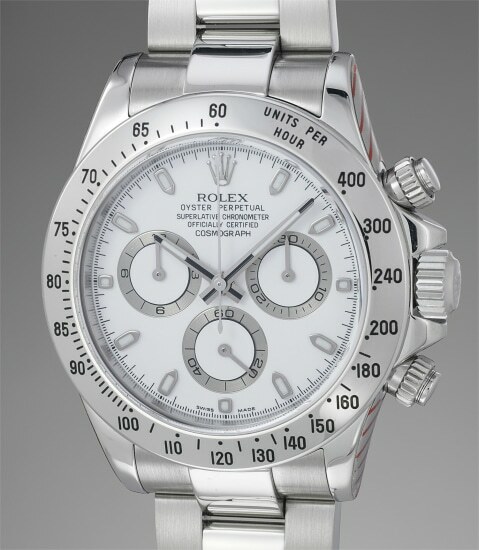 The watch most likely left the Rolex factory as is, due to a quality control oversight. Today, this 'mistake' has rendered the present watch incredibly rare and valuable, giving it a unique appearance. To the best of our knowledge, the present watch is the only known reference 116520 with this dial configuration to have appeared on the auction market. Furthermore, the watch is preserved in excellent condition and still retains its original caseback sticker. It retains its Rolex service stickers. It is furthermore accompanied by its original guarantee, stating the watch was sold in Paris.